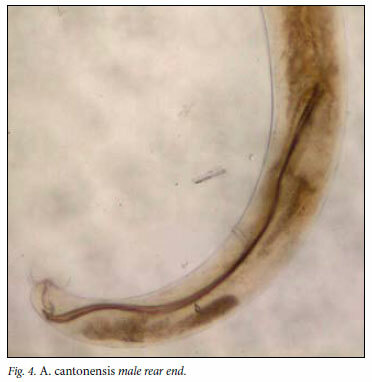 To the Editor: A study of the parasites of invasive rats in the eThekwini Municipality of KwaZulu-Natal has led to this first report of Angiostrongylus (Parastrongylus) cantonensis, commonly known as the rat lung worm, in South Africa. A. cantonensis is clearly endemic in this region and probably also in other areas of South Africa. 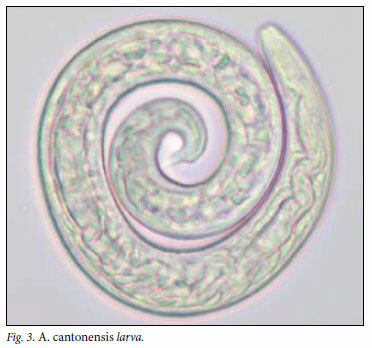 There are a few reports of this nematode from Africa (excluding South Africa): in rats and snails in Egypt (Fouad and Abdulla, 1978), in snails in Nigeria (Sowemimo and Asaolur, 2004), and a human case from Ivory Coast (1980).1 As humans are accidental hosts, the parasite cannot complete its life cycle, and immature worms lodge in the central nervous system where they elicit a condition known as eosinophilic meningitis. Many species of snails and slugs serve as intermediate hosts for A. cantonensis but no survey has been done in South Africa. eThekwini Health's Vector Control Programme has authorisation from the Durban Natural Science Museum (permit no. 4827/2007) to collect live specimens of Rattus spp. in baited traps. Our study in 2009 on parasites of invasive rats fitted in with this programme (approval by University of KwaZulu-Natal's Ethics Committee: Ref. 031/09/Animal). A total of 398 Rattus spp. (391 R. norvegicus and 7 R. rattus) were trapped during the year. Once killed, all ecto- and endoparasites were recovered for identification. Detailed results for these will be published in other journals. The heart and lungs were examined under a dissecting microscope. Adult worms were isolated from the heart, pulmonary arteries and arterioles of 56 rats, (55 R. norvegicus and 1 R. rattus), giving an overall prevalence of 14.1%. 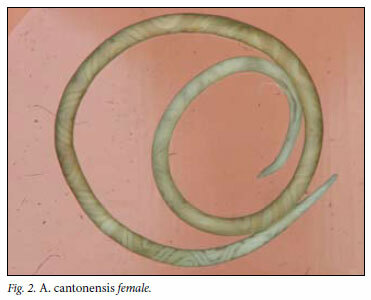 Polymerase chain reaction (PCR) testing confirmed the identification of the worms as A. cantonensis. Further PCR testing and parasite morphology will be carried out and the results published. When healthy patients become infected with A. cantonensis, the larvae and sub-adults remain in the CNS, commonly causing eosinophilic meningitis/meningoencephalitis. Other symptoms may result from human infections with this parasite and, although not as common, may cause severe illness and occasionally death. Human angiostrongyliasis is usually mild and self-limiting, and recovery takes place within a week, but paraesthesiae and muscular weakness may persist for years and represent chronic forms of the disease. Such cases may indicate heavy infections. A spinal tap is necessary for constructing a diagnosis of angiostrongyliasis, as eosinophilia is initially more likely to be seen in the CSF than in peripheral blood, and A. cantonensis larvae may occasionally be identified.8 It is advisable to specifically request the laboratory to perform an eosinophil count on the CSF. This requires centrifuging of the sample, making a smear from the deposit and staining with a routine haematological stain, such as Wright's. A. cantonensis is clearly endemic in the urban rat population of the eThekwini area of KwaZulu-Natal, and may be more widespread. It might also have spread to the indigenous rodent community. 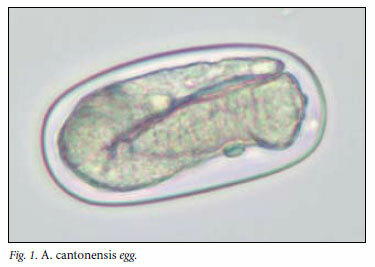 Since A. cantonensis is the most common cause of eosinophilic meningitis in people, a retrospective analysis of all cases of eosinophilic meningitis of unknown aetiology is necessary to assess the likelihood of human A. cantonensis infections occurring in South Africa. Although fatalities are uncommon in eosinophilic meningitis caused by angiostrongyliasis, young children and immunocompromised people are at risk of developing a fatal patent infection i.e. the larvae migrate to the heart and lungs, mate and lay eggs) with severe lung pathology. This is consequently another opportunistic infection to be aware of in AIDS patients!